Portable remake of the 1981 Taito arcade game, converted by Nintendo. You control a cursor that can trace lines across the play area. When you draw a line that joins with the edges of the play area or another line, the space fills in as a block. The aim is to fill in a percentage of the play area. 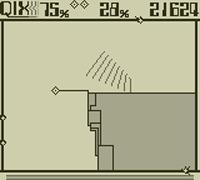 However, also in the game area is the Qix, a moving radar that destroys you if it touches you or a line you are tracing. Small sparks also follow the lines and destroy you if it collides with your cursor. You can also connect two copies of the game using the Game Boy Link Cable to play a 2-Player race to complete the puzzle. 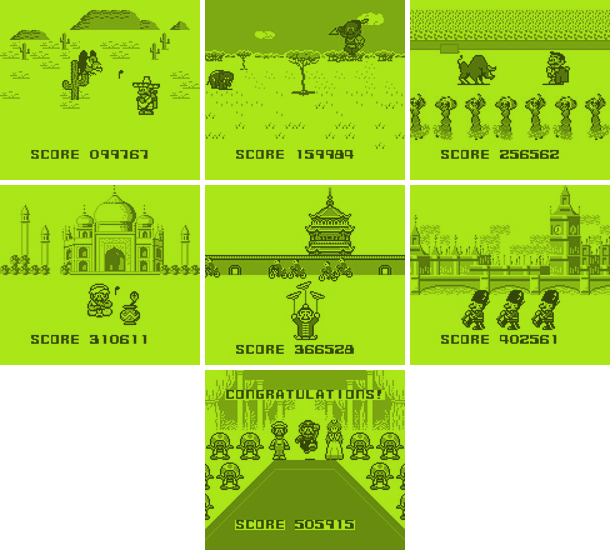 Once you reach 50,000 points and lose your last life you will be treated to a scene of Mario in Mexico. For every 50,000-100,000 points you earn more than that, different scenes set in different nations of the world are shown. When you play the 2-Player Mode, Player 1 is Team Mario (the dark cursor) and Player 2 is Team Luigi (light cursor), the heroes of the Mario series. 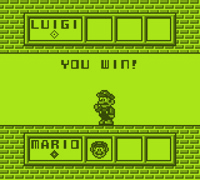 When you win, your Mario brother appears on your screen celebrating, and if you lose your Mario brother stands there doing nothing.